Be careful for what you wish for… Gaza, Ireland & death of our citizens. This week we have seen Israel invade Gaza, not for the first time, with the slaughter of its inhabitants. We’ve also seen the downing of a Malaysian Airlines Jet with the loss of life of those people on board. We’ve witnessed the ongoing dispute with Greyhound Bins who demand massive reductions to workers wages. We’ve also seen the few thugs in the Gardai manhandle citizens, as Vincent Browne likes to refer to us, outside the American Embassy and elsewhere. The sight of ill mannered thugs in police uniforms dragging a man on his head along the road, does nothing to enhance the image of a demoralised police force whose members I’ve found to be, by and large, good people putting their lives on the line to protect us all. We have seen more people dispossessed of their homes by the Banks as well as the horror of suicides devastating our people. Medical cards have been taken away from the sick and elderly and there is the ongoing battle against the privatisation of water and the ensuing water charges being imposed. Property taxes have been introduced by our Government although Enda Kenny, our beloved leader, has been against them in a previous existence. From atrocities in Gaza to the IMF’s insistence on dumbing down the Health Services in Ireland as too much money was being spent, there is one common denominator. That is that it is people who are the target of all of these measures. Not Giant Corporations or the Banking Community. The Arms Trade is blooming. Maybe pension schemes should invest in this business as it seems to that giant corporations are where your money should be. Definitely not in anything that remotely resembles local business or indeed supporting the citizen and the local economy. We live in a time when people are being controlled and relabeled not as citizens, but as consumers. The country is not being run to benefit the citizen but to enhance the profits of Big Business in all its guises. When you dehumanize citizens, it is quite acceptable, in their minds, that they can be collateral damage. Sure what if a few thousand are killed or unemployed, or just left to die at the side of the road? Profits are what matters. Businesses that profit the Elites are given tax incentives to come and set up businesses in Ireland today. Our priorities are to enrich these Elites at the expense of the citizen. At the same time services for the citizen are being curtailed while more taxes are being thought up by our Government every other day of the week. There is more ways than bombing people out of existence, as is happening in Gaza, to control people. The loss of your job, home, medical benefits, social welfare entitlements and the imposition of unjustified taxes on people at the behest of the IMF and their fellow travellers, is indeed akin to actually bombing them out of existence. In Ireland today, people are suffering and dying while others enrich their lifestyles. Our Government have taken directions from the European Union, the International Monetary Fund and the International Banking fraternity and imposed their directives on the Irish people. These imposed changes are killing our people. Despite the efforts of our marvellous doctors and nurses, people are dying on trolleys in overcrowded hospitals. It is the most vulnerable in our society who are suffering the most but this does not change anything. As a lawyer, I see the high street solicitor and the junior barristers suffering on a daily basis and struggle to survive. These are the lawyers who represent you, the people. I do not see the lawyers servicing the interests of the Corporate set suffer at all. In fact they thrive as they are paid handsomely by Big Business and Governments and International Bankers. The rights of workers are being eroded on a daily basis and these short-term contracts in lieu of proper terms of employment are giving our people no security to enjoy their lives and raise their families with any degree of certainty for the future. If history have thought us anything, it’s that war follows on from a recession. With all the political manoeuvring by the super powers, financed by the Elites and the insistence on control of oil and natural resources to call their own regardless of where located, the future does look bleak for the ordinary man, woman and child. Not so bleak for the Big Corporations who are hungry in their pursuit of financial gain, both short and long-term. Our Government have played and indeed continue to play their part as the good boys of Europe and have not ever taken a stance for the citizens of this country. The continued imposition of austerity, despite the suffering of the Irish people is akin to the imposition of fascism on the nation. No doubt our Ministers, on the instructions of the Government, will follow the party line, so to speak, and give support to those Elites that demand the continuing demoralising of the Irish people for some time to come, while lending our support to whatever super power we’re to be aligned with, regardless of the cost to the Irish people. We are told we live in a democracy. On a daily basis we see wars fought to bring democracy to people all over the world. Democracy I was taught, was Government by the people for the people. Well the democracy we’re witnessing throughout the world would appear to be fully under the control of Major Corporations whose interest is far from anything that is pro people. Be careful for what you wish for. LegalEagleStar , Monday , 21st. July , 2014. What can you say about Katie Taylor that hasn’t already been said ? Katie single-handedly lifted the roof of doom and gloom from the Irish Nation on Thursday afternoon when she realised her life’s dream and won Olympic Gold in Boxing for Ireland. She is a hero among her own people and her efforts have given us all a sense of purpose and joy. Thank You Katie Taylor. You are one fabulous young lady. Over a lifetime of involvement in the law, I’ve had to deal with the Garda Siochana on many levels. I have seen the progress as well as the demotion of individual Gardai and by and large I have been impressed with the level of integrity and humanity that most show when carrying out their duties. Of course, we come upon the odd bad apple, as in all walks of life, but unfortunately there is nothing as rotten as a bad Cop. The misuse of the Garda Siochana is what annoys me the most. When political influence interjects to corrupt the Force it spells disaster. In the Ireland of the 1970’s there was no shortage of Gardai to man the ‘political police’ who spent many hours working against those who threatened the State. Politicians left no stone unturned to capture their ‘enemies’ and legislation was enacted to allow for the detention of ‘suspected terrorists’ when the need arose. People were targeted for the most menial of reasons and I personally believe that many became involved in the ‘troubles’ as a direct result of police action who would otherwise not have done so. My point is, that once the State felt threatened, it threw all it’s resources to protect itself regardless of the consequences to the civil rights of those who, for one reason or another became politically active against it. There was never any issue of not having enough ‘Special Branch’ on the ground and manpower was never an issue. The State in this instance was in fact not you and me but the interests of those in power. The old ‘civil war’ politics which have divided this country for many years were alive and well. The Free State was to be protected at all costs. Times, they are a changing. Today politics have moved on. The Good Friday Agreement has unleashed those who ‘threatened the State’ into mainstream politics. This can be nothing but a good thing, although unfortunately it has left behind some of those who feel that the politicians are now pursuing another agenda. I suppose, following the Civil War in the 1920’s there were those who felt betrayed and disfranchised. That is where the politicians fail. Not to be inclusive is to distract from the reality. I truly hope that progress can be made to bring about an inclusive society where the rights and aspirations of the Citizen can be nourished, not quashed. Today in Ireland, we have many problems. Most have been due to the ineptitude, self-interest and downright corruption of the political classes. As a State we have lost our sovereignty. Joan Burton, Labour Party, has stated that we have pooled our sovereignty with our friends in Europe. This loss, or pooling, is in the interests of those who want a United States of Europe, a matter that has never been openly put to the Irish Citizen. Nonetheless, we are now being dictated to by Foreign Powers regardless of our wishes. 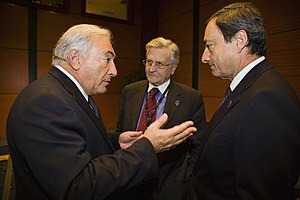 The interference with the independence of the Garda Siochana and the cut-backs being imposed by our Government, clearly at the behest of others, including the International Monetary Fund, the IMF, have left the Citizen exposed to forces whose objective is the dismantling of society as we know it. Only last night on National Television we saw the open drug dealing on the streets of our capital city, Dublin. Some have asked why RTE cameras could expose the transactions taking place while the Gardai on film seemed to be acting under crude restrictions. From talking with members of the Force over the last while, I have received an education. Their resources have been cut to such an extent that it has become nigh impossible for them to carry out their duties. The Force has become depressed as a result and the Citizen is the one suffering the brunt of the actions of the politicians. This begs the question… ‘In whose interest are the Garda Siochana acting?’ Well, they are there to protect the State. They take their orders from the political classes, those same people who have sold out our sovereignty to others whose interests are not in line with those of the Irish Citizens. Who is benefiting from the cutbacks? Well as shown, clearly not the Citizen or indeed the Garda Siochana themselves. Who then benefits? Well I suggest the Drug Lords, Corrupt Bankers, White Collar Crime etc. One could suggest they are one and the same people ! 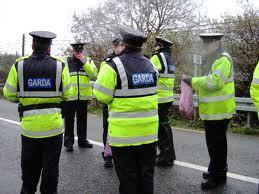 The Gardai, despite their misuse on picket lines are our protectors. We should listen to them when they tell us they are suffering. When the old and vulnerable in our society are being brutalised by thugs and gangsters who operate now freely in our society. Is it not time to call an immediate halt to the disastrous policies on policing currently being imposed by our current Government ? Or is it now fact that they really control nothing and that policy is being dictated solely by a Higher Force which is blind to the needs of the ordinary citizen. If the same mentality existed today as in the 1970’s as regards the protection of the interests of the State, things would be very different. Or would they? In those dark days as today, maybe the interests of the political classes are still being served. Maybe the Gardai have been used all along to protect the Elites among us, not the ordinary citizen. Today the Gardai rank and file are not happy being used and abused in this way. But, will anything change ? LegalEagleStar , Friday , 22 nd. June , 2012 . The Spirit of the Irish. C’mon you Boys in Green. Sunday evening will be remembered in Ireland, not as the Start of our Euro Campaign but as a disaster for the Nation. The flags, bunting and suchlike that adorned our houses and streets, even the wing mirror covers in Green, White and Orange. looked rather sad on Sunday evening in contrast to earlier in the day when they signalled a sense of hope. Even our stalwart commentators and experts, Johnny Giles and Eamon Dunphy looked sad and somewhat lost. Come Monday morning the first light of hope emerged. Sure if we beat Spain and Italy we’ll progress from the Group and lift our spirits again. Was this wishful thinking or indeed a sign of a resurgent Nation? The realists will tell us that Spain are unbeatable as they are current World and European Champions. And Italy, well they are Italy, need we say any more. The man in the street though has an inkling…a little hope where hope seems lost. Yes, we’ll do the business. 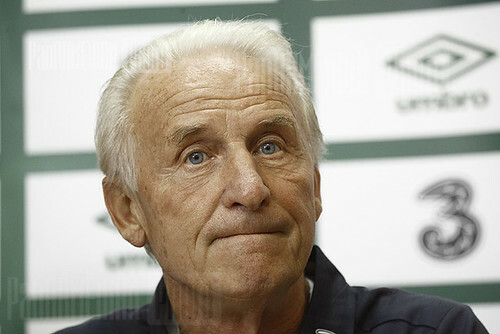 Sure isn’t it only eleven v. eleven and don’t we have Trapattoni on the bench, a General if ever one was needed. The Spirit of the Irish is something that has taken a trashing over the last few years. The Germans, French in more ways than one ( remember the hand of God !) and other monsters has conspired to put us on the rack, with a great deal of help from our native politicians who have sold out our sovereignty to the mighty Europeans who we now face in Poland/Ukraine. The spirit of the Irish has a ‘never say die ‘ attitude and as long as we have faith, however misplaced, we will continue to face the most uphill battles with a sense of National Pride. I will be watching the Spanish game in the Irish Club in Chorlton, Manchester this Thursday as a guest of a fellow lawyer and nothing short of a victory will satisfy our hunger. The Spirit of the Irish will be on display for all to see at home and across the planet and when we win, even draw, sure that’s a victory…we’ll be looking forward to ‘Trap’ planning the destruction of his native Italy in the days to follow. Of course, if all goes belly up we can follow the fortunes of England who always provide us with a great deal of entertainment, even if in a negative manner. C’mon the Boys in Green !! Upgraded to First Class, met by Tornadoes, then Wildfires. Welcome back to Texas. We left Dublin Airport at midday Monday en route to meet up with family members in Texas. On arrival at the Departure Gates my daughter and myself heard the welcome news that my eldest daughter had arranged an upgrade for us to First Class on Delta to Atlanta. So, we both slouched down in luxury for our Transatlantic Flight. We were both oblivious to what lay ahead and never noticed the fact that the Pilot never spoke to us regarding weather conditions en route nor at Atlanta, our initial destination. While the landing was rough and the weather very rainy, we thought nothing of it. We had come from Ireland after all and such conditions are an everyday occurrence. Well, shock registered upon watching CNN while awaiting our connecting Flight to San Antonio. We heard that two tornadoes had touched the ground in Atlanta about the time our flight was landing. We communicated that to my daughter in San Antonio who informed us that she thought we’d been diverted elsewhere because of the stormy conditions. As it turned out we arrived in San Antonio, safe and sound, only an hour behind schedule. After leaving Thunderous Cloudy skies in Atlanta, we still encounter thick clouds through Alabama, Mississippi and into Louisiana. Only when we hit The Great State of Texas did we see clear skies again. A great sight to behold after the drama we’d just left behind. 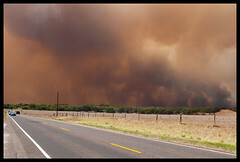 More drama was to greet us though, as we could see Wildfires north of San Antonio and south of Austin. After speaking with friends, we realised that the City of San Antonio Fire Department has been and is fighting Wildfires in an around our city. Many people have lost their homes and there have been a number of fatalities. This State has seen little or no rain since I was here last May/June. In fact at that stage, they were praying for rain each Sunday at Mass. What a change from what we are used to in Ireland. I contacted a pal in Austin yesterday to tell her we’d arrived and looked forward to seeing her. She said she’s have to see how the situation was in a few days time as there have been outbreaks of bush-grass fires near her home and in fact she feared for the safety of her area. I pray that she and the rest of the people here in this Great State overcome their current difficulties. What they wouldn’t do for some of our Irish Rain here now in Texas. As for me, I’m back where I love, Texas with it’s huge clear blue skies and temperatures in the mid to high 90s. I’m here enjoying life with most of my family including Toes, my grandson. Thanks to someone’s prayers I survived to tell this tale. My late father would be 95 today if he’d lived. No doubt he’s still looking out for all of us. Today has been a frustrating day. Started off fairly well, as well as could be expected. Yet another sleepless night worrying about the kids, the dog, my mother and a couple of clients who I feel really sorry for. Then the phone call I’m awaiting, well hoping for really. The day started with me listening to Newstalk Morning News. Maybe it was just the sound of Enda Kenny’s voice declaring that he hadn’t lied to the electorate when he said he was going to protect and maintain the services of a Hospital prior to the General Election. He hasn’t, and has now ‘seen the light’ and realised he can’t fulfil his election promises. Nothing new there you might say. Well, what was the purpose of the original statement? If it was to ensure that he and his Party got elected then things would make sense. Because now, we’re told that Hospitals are unsafe and we need to go to the Major Hospitals for care. The problem is compounded as we’re now told by the Doctors that the major hospitals are unsafe. I’m sure, like me, you are fed up with Spin and the absolute nonsense we’re expected to believe. On the facts today it seems that all the Medical Negligence cases we have Must Succeed as quite clearly today… all hospitals are unsafe, according to Enda Kenny, our Fine Gael Taoiseach. If only life was as straight forward as that. 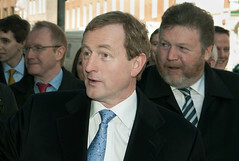 Listen, Enda lied to get elected. That’s the story. No more, no less. So, angry and frustrated I head into the shower. Lovely moments alone, with the sound of the water caressing you for those few minutes. Maybe after Enda’s Government start rationing water, charging us enormous amounts to actually use the water.. I’ll have to take a quick shower. To think that we’re a small island surrounded by water ! The loss of my only morning pleasure will be a sad day. Maybe I could give the dogs half a bowl of water instead of two. That would conserve some water… or maybe that would be cruel. Will the Minister make a Doggies allowance for us? Will he hell. It’s now mid morning. All my calls, bar one, have rung out. I’ve left message after message but so far, nobody has phoned me back. No, after checking, it is indeed A.M. not P.M. and it is a weekday, not the weekend or indeed a Public Holiday. What to do. Sure maybe I’ll write this weeks Blog. Yes I’ll do that.. Wait, a phone call for me. Great, ‘Hello Tom Baldwin, who am I speaking to?’ Oh no, ‘I don’t want to talk to you ! No, my computer is fine. No, no …’ While I try to be civil to this foreign gentleman, I end up telling him to ‘Feck Off’ and slam the phone down. Maybe that will have the effect of me being deleted from their database. Wait, was that the guy or was that in fact my Bank? Now, I’m not sure. After some moments I decide that it could have been the Bank. Well, if so, I gave them the right answer. Nearing lunchtime, I’m home and sitting down working on research for my Blog. Then, at the door I hear a shriek.., ‘Aarsse’. I know that sound. It’s Toes, my grandson, coming to visit me. So, off to play then. After lunch it’s clear said Grandson is getting narky. I ask him if he wants to go to bed? Shake of the head indicates No. I’m not convinced. Are you sure I ask him. Same response. After some time playing with the Dogs and the Parrots I ask again, as I’m unconvinced that he is sufficiently alert to last the afternoon. So, upstairs to bed, turn on Daughter No.2’s Red Hairdryer and put Toes to bed. As I lay on the single bed beside him I start to feel guilty as I wave to him. Hold on, he’s dropping off. Yes, result ! Problem is that I’m doing the same. OK, back to the computer. I wonder will any of those gentlemen and ladies of my esteemed profession actually return any of my calls ?? Well, I suppose, I can only live in hope…..
LegalEagleStar Tuesday , 12th. July , 2011.